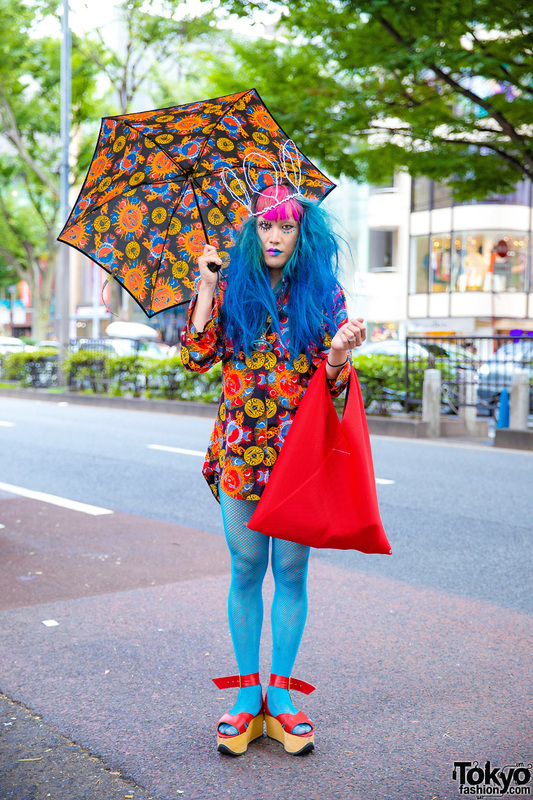 Japanese vintage fashion buyer clad in a colorful shirt, fishnet tights, rocking horse shoes, wire crown and umbrella. Harajuku student sporting a colorful fashion while out and about on the street. Harajuku kid sporting mixed prints fashion wearing a galaxy print shirt, printed ruffle skirt, cat print knee high socks, floral print high top sneakers, a shark bag and cute accessories. Japanese designer on the street in Harajuku wearing handmade fashion including a galaxy print top, clear skirt over galaxy print, fishnets, and fuzzy platform heels with bows. Japanese college student with a blonde bob hairstyle, dark blue maxi coat, and ribbon-laced galaxy-print sneakers. 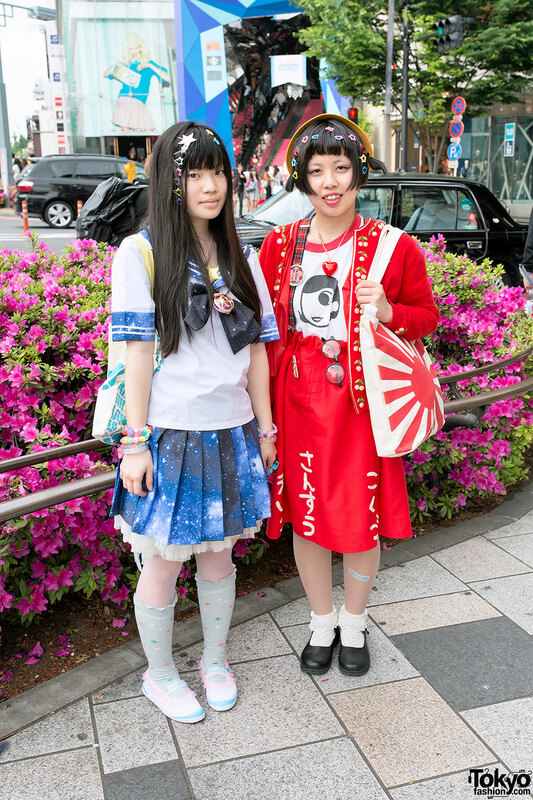 Harajuku high school girls wearing a sailor uniform with colorful hair clips and Sailor Moon accessories. Harajuku girl with bob, denim jacket, galaxy print sweatshirt, pink skirt and backpack, white tights and sneakers, and Snow White bag. 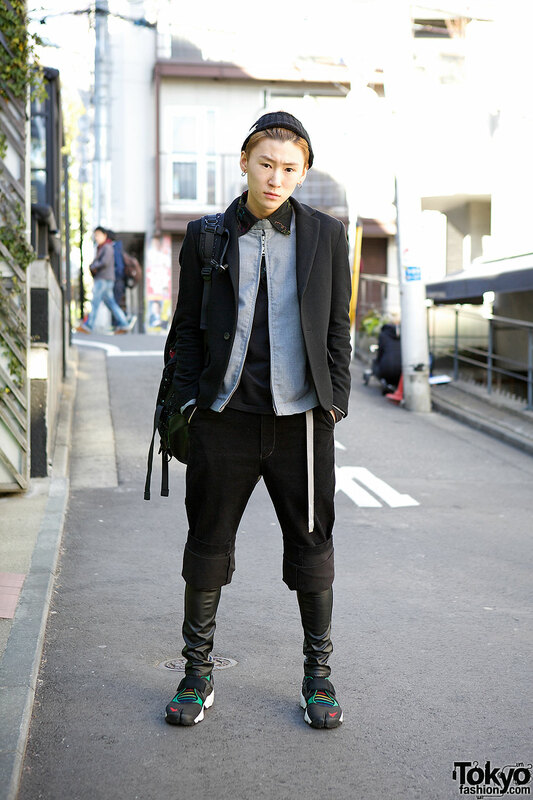 Harajuku guy in a knit headband, zippered top, layered pants, galaxy print backpack and split toe shoes. Harajuku girl in pastel outfit, wearing sweatshirt and shorts, white coat and tights, galaxy backpack, haters headband, and platform shoes.